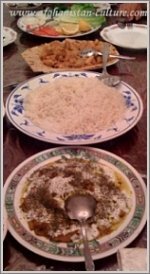 There only two Afghan restaurants in Los Angeles that serve authentic Afghan food with a warm welcoming and great hospitality. 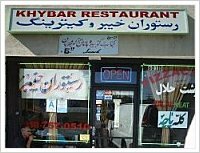 Khybar or Morigi’s is an Afghani Restaurant located in Reseda Blouvard, Los Angeles California. The restaurant is owned by M. Yasin Safdari who serves authentic Afghan food for its Afghan and non-Afghan costumers in a daily basis. Khyber restaurant was published in a Los Angeles Times article on August 12 2009 for its best authentic Afghan food and hospitality. Khyber restaurant serves different types of food including the national dish of Afghanistan Qabeli palau, Mantu, Ashak, Bulani, Kabobs and other Afghani yummy foods with Halal (Kosher) meat. Azeen restaurant is an Afghan family owned restaurant located in Pasadena Los Angeles and services authentic Afghani food. If you are around the neighborhood and haven’t tried Afghan food, I would suggest you to drop by and try their Mantu or Qabeli Palau if you are vegetarian; I guarantee you will have a great experience. They are very friendly people like many other Afghans and they treat their customers like their family member. 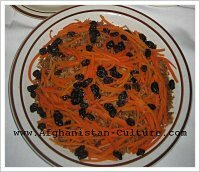 Good Luck on your restaurant hunting, and enjoy your Afghan food, I am sure you will love it.